Follow the Moon: Forecast for November 4, 2012 - November 10. A giant storm spiraled its way into the east coast last week stirring up the lives of millions of people. The winds and rain have dissipated but a lot remains to be dealt with. The impact is certain to be profound. It is good to pay attention to what this means as we go into an election and as we contemplate our next steps. attachment, the time we live in calls for action. A wise friend of mine recently pointed out that before we are ready to act, we need to wake up. But waking up isn’t enough; we also need to care deeply about the outcome. Only then will action flow more easily toward solutions. We look at our problems as insurmountable. Perhaps that is because not enough of us have awakened yet into how much we need to care—not just for ourselves, but for every being on this earth. The planetary allies are conspiring to move us along this path of action. Waking up. Mercury is good at giving us jolts. This god of communication, electricity, and travel (to name a few areas of his domain) is playing a huge role right now as it slows down to station retrograde. During the Full Moon storm, Mercury was at 0 degrees Sagittarius exactly squaring Neptune at 0 degrees Pisces. Square aspects are challenges from the gods to humans. These two sent a message that we are vulnerable to these oceanic forces. Our systems are fragile and our choices about energy usage are creating climate change, which puts these systems at risk. Caring deeply. Interestingly, Neptune also is opening the way to caring more deeply. This ocean god invites us to melt away the boundaries of separation. Just like the waves that reconfigured the beaches of New Jersey, Neptune in Pisces is working to wash out old structures within us. A certain amount of surrender is called for. Neptune’s surrender leads us to connection and compassion. Neptune isn’t acting alone. Chiron in Pisces initiates us into a deeper sense of vulnerability and a desire to find our commonality. These allies are shaping our choices right now. I believe these forces are asking us to wake up, care more deeply, and act now. It is all about balance. This New Moon cycle began in Libra, the sign of the scales. As the climate changes, storms are getting stronger. Such storms seem to be the climate system’s attempt to find new balance. The farther we move into extremes, the stronger the balancing force has to be to get us back to equilibrium. How do we use the personal work we’ve done to bring about the balance in our lives to create greater balance in our human systems? How do we wake up and care more deeply about what is happening? I’ll offer this idea: The sacred reminds me how precious this world is. As I devote myself to sacred places, to the sacred elements of the earth, and to the sacred beings who live here, my heart cracks open to how much I want their safety and wholeness. I mourn the loss of life, human and others. I mourn the unjust burden that falls upon the poor, the unwell, and the disadvantaged when our fragile systems are crippled by imbalance. I remember how much is at stake when I think of the children born and yet to be born who inherit these problems. From this awareness, deciding my next step becomes easier. What opens your heart? What will you do? Sunday, November 4. With Saturn’s recent entry into Scorpio, a new pattern has emerged. We’re having more days when the Moon is mostly void-of course. This means that the Moon has finished making aspects with other planets and goes “void” until it enters the next sign. All the outer planets, from Saturn through Pluto, including Chiron are all in the first 10 degrees of a sign right now. This unusual situation means that we will be experiencing more void days for a while. The last aspect the Moon makes before going void-of course sets a tone for the rest of the period. That aspect resonates like a bell into silence. 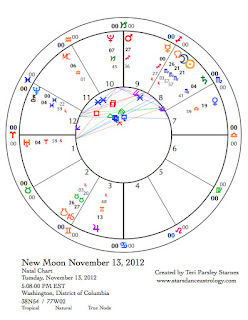 Today, the Moon in Cancer is void-of-course after making a trine to the Sun before dawn**. Both are in water signs. Water and emotions can be easily whipped up into overwhelming waves. Today let the resonance of the “water bell” help you find the peace and compassion hidden in the heart. Monday November 5. The Moon enters Leo early this morning. With his Leo Sun, President Obama will be energized on this last day of campaigning. His opponent Mitt Romney will undoubtedly be feeling the pressure to succeed since his Saturn is also in Leo. In addition, transiting Saturn in Scorpio is making significant aspects to both men’s charts. Saturn is squaring Obama’s Mercury, the ally of getting his message across. 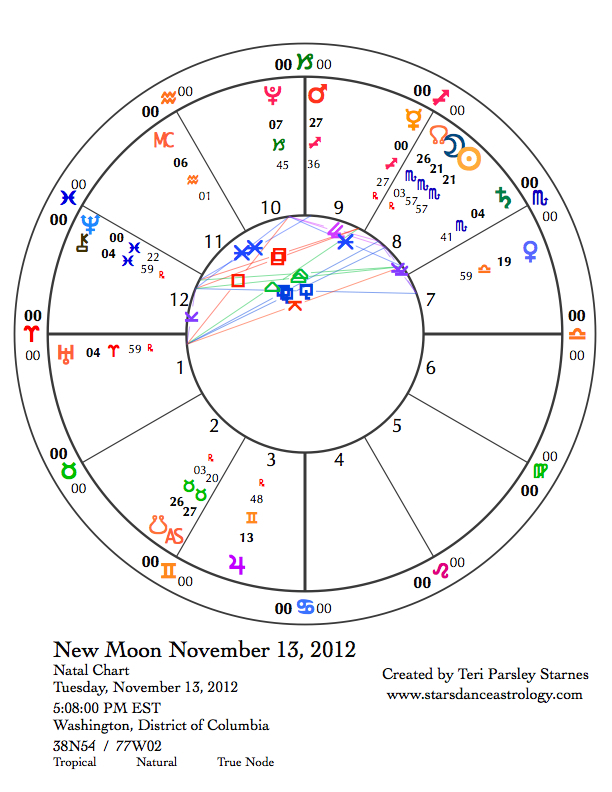 For Romney, Saturn is squaring his natal Saturn, the ally of achievement. He has reached a pivotal place in his life. There are a lot of uncertainties about this election. The Moon today might reveal who has the momentum to succeed. Every one of us is important to the outcome. Share your light. November 6—Last Quarter Moon: Evaluating. It is important not to lose track of what we care about deeply. Emotions will be high today. Mercury stations retrograde on an Election Day. Some astrologers think of retrogrades as Mercury’s visit to the underworld. In that place, Mercury sweeps away secrets and fears. He carries messages to and from the deepest parts of our selves. Astrologer Caroline Casey says we aren’t electing a person, we are electing a vision for the world. Let the rebellious, trickster nature of this retrograde Mercury be your ally in electing a vision of balance and reverence. We are poised to use our evaluations of the state of the world’s imbalance to open our hearts and to act. Be critical, but don’t be despairing. Wednesday, November 7. Post-election. There is a possibility that no clear resolution to the election will be known today. A possibility, not a certainty. The last aspect the Moon makes before going void for most of the day is a trine to Mars. The call to act resonates. Be courageous as you seek expansion of possibility. Tonight’s dreams may be influenced by the Moon in Virgo opposing Neptune. The quest is for wholeness, where our actions truly are in alignment with our hearts. Thursday, November 8. Last night’s dreams may be inspiration for getting back to work today. The Moon in Virgo encourages us to bring order to our lives in some way. That might be a struggle since the retrograde Mercury can cause disruption to those systems. Some will still be trying to put their lives back together after the storm. If things do not improve quickly, tempers and patience will continue to flare. Friday, November 9. Venus in Libra trines Jupiter in Gemini. This transit encourages communication that brings a sense of harmony and balance. These benefic planets bless our interactions. The possibility of achieving balance comes back, if only temporarily. Pay attention to this energy. It can guide us when we lose our way. November 10—Balsamic Moon: Surrendering. It isn’t always easy to let go. Many of us are programmed to think that me must always push farther ahead, always be aiming for greater things, that growth is the only way we know that something is happening. This phase of the Moon reminds us that letting go is as important as beginning, manifesting, or learning from our work. This letting go reconnects us to our open hearts and is extremely important stage in achieving balance. Early tomorrow, Neptune will station direct. When a planet stations, it slows down in its apparent motion and looks like it is standing still. These are potent times to notice the energy of any planet. If Neptune wants us to dissolve the structures that keep us separated from each other, what are you noticing about that process today? The Moon returns to Libra where it was when this lunar cycle began. Take stock of your inner scales. How do you realize the balance in your life? How will you act to create balance in our world? The way forward is full of challenge but is also exciting. Have you acquired new tools? ** All times are Central Time Zone.